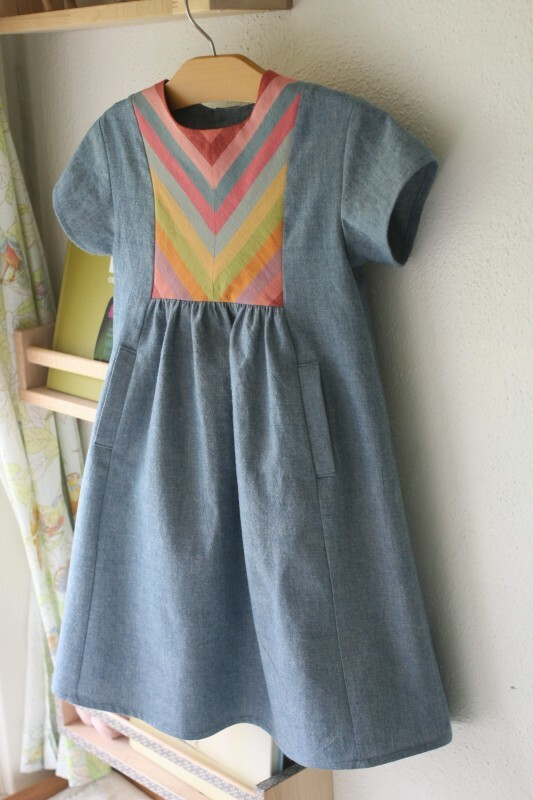 Today we have a very cool Rainbow Hide-and-Seek Dress sewn by Gail of Probably Actually. She did something special with the yoke. She didn’t cut the yoke out using the v-notch neckline, but yet she achieved the look of a v-notch neckline. The yoke pattern pieces were cut out of rainbow striped fabric at 45 degree angles, then sewn together to create 90 degree angles or a ‘V’ pattern, in the end creating this amazing front yoke. Read more about this dress in her blog post here and see the rainbow striped pockets, too. Gail, that is just adorable. Thanks for letting us share it! I love this one! Very inspiring. Off to peek at the pockets. Its just so lovely. How very very clever. I really love this, I would wear this myself!